OMG SQUEEEEEEEEEEEE! This is too awesome. THANK YOU! Love how the assassin’s creed one fits so perfectly into the lock screen, keep up the good work! You are amazing, I have never liked a cartoon this much. Please make some Retina Display wallpapers for iPhone!! I wants to buy a t-shirt! 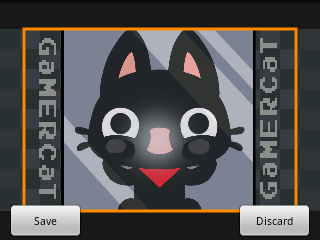 Hi!, I can translate Gamercat into spanish? ^^ I love it so much! And the english it’s easy, i can understad well :3. One thing, you send merchandise to Spain? Ehm… Are There DS or Something Like That Cover? You should definitely make one of the Journey comic, that one was awesome. Cat is my favorite animals so i want this wallpapers for my background on PS Vita. So awesome! Wish you could do a PS3 version, i really love GC! i love the mario one, and the link one.